Some people have suggested having fewer business meetings, because they are often so deadly boring. New ideas to make business meetings more interesting, and to include meals that are fun, can be instituted without changing the number of business meetings: Hold your business meeting at 7:00pm or 6:30pm (this may require a change at grand lodge level in some jurisdictions), and then hold a dinner or festive board with speakers and new candidate introductions AFTER (NOT before) the meeting, serving only coffee before the meeting for early arrivals. This will shorten the meetings because all will want to get to the food and no one will be already full and, therefore, ready to argue some point of lodge etiquette, etc. Also, those who really need to leave earlier will be able to leave before or during the meal. Few will want to leave before or during the presentations or activities at the meal if it is a fun meal with good food. It is easier to make a meal interesting than it is to make a business meeting interesting!! And affording such a meal can be as simple as having a customary toll of two to five dollars as each brother enters the kitchen or gets in line to serve himself. Do not read the minutes of previous meetings in open lodge. Have them available for reading either on the internet or copies available prior to the opening of the lodge. I have seen this done in lodge and it works quite well in my opinion. It saves 15+ minutes in the business meeting. Having already discussed "in brief" the "New Model" business meetings, let us address the "work meetings" where initiation, passing and raising is done. The meeting should begin as early as possible or practicable with only coffee for early arrivals, as at all meetings. Most, if not all US rituals contain a first and second part for each degree. The first part should begin on time and should end with a "call from labor to refreshment" by the WM through the JW. The "refreshment" should be a meal, a full meal, prepared and served by the stewards and _all_ EAs and FCs or catered and then set up and served by the stewards and EAs and FCs. This makes the EAs and FCs a part of each lodge meeting no matter what degree it is held on. Also, EAs and FCs could be "excused" from kitchen duties to watch the "work" of the lodge before serving the meal at "refreshment". This also allows those who need to leave early to leave after the first part of the "work" or during the meal. It also shortens the meeting because it cuts down on the need for a "smoking break" as the candidate dresses for the second part of the "work". This candidate dresses as the brothers are being served dinner and is conveyed into the dining hall as an "honored guest" after the first part of the "work". Then, when the dinner is over, the lodge is "called from refreshment to labor" and the second part of the "work" is presented to the officers and die-hards who want to stay, along with a few members who would have been lost at a "smoking break" between the first and second parts but are happy, well-fed campers who want to stay to see the lecture, etc. In order to promote masonic education and maintain member interest throughout the month, educational meetings, with a speaker or activity, such as a festive board with a theme can be held during a regular work meeting night when no initiations, passings or raisings are scheduled. These meetings may also be scheduled far enough in advance to attract a popular speaker or grand lodge officers, but they should not be scheduled in any less time than needed to be able to announce the educational meeting during the business meeting preceding it. This will tend to ensure support and participation. Educational meetings should be open whenever possible to encourage members to bring friends and prospective members for introduction to the lodge, and vice versa. The educational meeting should have the same basic agenda as the business meeting, with the meeting held before the meal, whether in the lodge hall or in the dining hall already seated. The meeting could be held as a dinner when a speaker is the program, continuing the theme of making the lodge a place to come to have a good fun dinner. Or the meeting could be held in the lodge hall when a special presentation requires staging or special group participation with the festive meal held afterword to keep interest increasing and presentation time decreasing. When holding only a dinner with a speaker, there is little reason to vary from the traditional plan of holding the meal and then introducing the speaker. But remember to get any "business" done prior to the meal to leave the speaker for uninterupted "show time" while everyone is full and happy. You want the presence of a meal to be a main reason to come to the lodge, both for the food and the fellowship that accompanies good food. Your lodge must avoid "cookies or cake and coffee" and develope a reputation for having a good meal _every_ time it meets. But only coffee for the early birds should be served before a meeting of any kind. A meal, a good meal, at _every_ meeting is essential, even if it is only the Senior Steward's "specialty" hot dogs and beans, with home fries. But the meal should be prepared and ready for the "refreshment" portion of the evening and not before any of the meetings start, as discussed above in the discussion of the Business Meeting. Lodges should consider preparation of meals before the day of the meeting or catering the meals to avoid the "stewards in the kitchen" problem that makes life hard for the stewards and discourages new members from seeking to start in the chairs. Serving as steward should not be a back-breaking rite of passage, it should be a chance for the stewards and the FCs and EAs to serve and meet all of the members on a personal level during the meal. Even a great Senior Steward can be worn down by two years of starting meals two or three hours before every meeting. By the time he is ready to be junior deacon, you may have lost a good officer to "burn out". How many of your lodge's junior stewards stay on to be senior stewards? On the meals, what we do here at Cochran #217 is this: The meal for the first meeting of January is prepared or supplied by the WM. Our second meeting of each month is family night, and each family brings a dish to pass. The February first meeting is the SW; March first meeting is the JW, etc. This takes the load off the Stewards as far as cooking, etc. It gives all of us a different meal each meeting, and each officer only has to do this once in the year. With family night on the 2nd meeting night we eat REALLY WELL due to the ladies bringing their best home cooking. (Hard to beat 3 different types of Chicken & Dumplings.) The Stewards are still responsible for the K.P., supplies, etc. We've been doing this for 10+ years and it works really well. There is always lots to eat, and the word gets out how well we eat, which helps bring in a visitor or two. Something that we've added in the past two years is a program on every family night. We invite a guest speaker in for a 20-30 minute talk or presentation. This is not always Masonic, but it is always interesting. We've had the Local Cancer people talk about Breast Cancer; a Doctor (and his family) came and discussed prostate cancer; and last meeting we had the Director of the local "Wings" (Women in need of God's Shelter) talk about domestic violence. We also invited our new editor of our local newspaper, and she was REALLY impressed. I think it was a first for her. I think one of the reasons that we are so busy is that "we've never done it that way before" is NOT allowed in our Lodge. We'll try most anything once, if it doesn't fly, then we try something else. If you're asking about a regular Blue Lodge with libations after the work of the evening is concluded, then my Lodge would probably fit that mold. We are a fairly young, mostly professional, group, and we'll have anywhere from 35 to 70 at a regular monthly meeting -- even in the dead of winter. We always have a multi-course catered meal at a very reasonable price -- $10.00 to $12.00, unless it's a special event like a Table Lodge, then the price is still under $20.00. Only after the Lodge is closed, which is usually in the vicinity of 9:30 PM, most of us will gather around a table in the dining hall for a collation of desserts and a few adult beverages. It's not uncommon to have 20 or more staying after to further enjoy everyone's company. And, after dinner yet before we reconvene in the Lodge Hall for our monthly business meeting, many will head into the "club room" to enjoy a cigar for ten to 15 minutes. Then, it's upstairs for the business meeting and the conclusion of our degrees. Needless to say, we have FUN. We make the time spent in Lodge QUALITY time. We make those attending WANT to come back next month if they can. We involve the wives and families in many of our events throughout the year and try to make them feel part of the Lodge too. It doesn't always work out, but at least we are trying! We may not have much money in our bank account, but we are filthy rich in terms of brotherly love and camaraderie. I wouldn't trade THIS lodge for any other. Hope the above helps. When I was visiting lodges in England I enjoyed the festive board at each of the Lodges I attended. The first Lodge I visited was Quatuor Coronati and the festive board was held next door to Freemason's Hall in the Connaught rooms. This was in November of 1990 when I was master of Texas Lodge of Research. The second visit was in 1995 to a Lodge in Chippenham where my wife's sister lives. I had met the Secretary in 1990 and kept up a correspondence with him during that time. He picked me up at my sister-in-law's house and took me back to his house. We then walked to Lodge and he explained it was safer because the laws on DWI/DUI were strong and strictly enforced. The walk was al little less than half a mile so it wasn't too much. When we arrived I left my apron and white gloves in their locker room and we went to the bar where the deacons were serving drinks. My friend had a mixed drink and I had a Coke. We spent about thirty minutes there before everyone went upstairs for the meeting which, of course, was done in the 1st degree. After the meeting we went back to the bar where some picked up a drink to take to the festive board. I stayed with my Coke until the eleven toasts. Red wine gives me a headache and, even though I just sipped a little at each toast I did wake up with a slight pain in the back of my head. 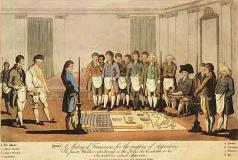 This procedure was typical of each of the five Lodges, away from London, that I visited. I really had a wonderful time and I never noticed anyone that overdid the spirits. I can't wait for my next visit in May next year. As the Sect. of our local area's Scottish Rite Club one of my many challenges is to come up with programs and educational speakers for our monthly meetings. I also had some luck as Master of my Lodge in increasing attendance. No "tub-thumping" intended here! I just wanted to emphasize that the following simple things worked for us. One thing I think has been mentioned before is that having a program will get people into your Lodge. It really is that simple. As to where to get these programs there are a lot of great ideas, but one that bears repeating is to get on the phone and ask people. Not everyone can be reached and not everything can be accomplished on the Internet. Remember that a lot of the people who will do great things to help you do not have or want access to the net. Our Grand Lodge and the head offices of all of the appendant bodies in our state (Kansas) are happy to steer anyone who calls toward appropriate speakers. Our Grand Lodge even has a special "Speaker's Bureau" and they will send a speaker or presenter if asked. This covers my state but try the Grand Lodge or Scottish or York Rite offices or the Shrine in your area. Even if there is no formal group available that provides speakers or presenters, I would imagine that the people at that office might have suggestions as to someone in your area who can do a program. I have found is that this is easy to do, it only takes a phone call, it's inexpensive, time efficient and above all, it works! I have seen a direct correlation (in both appendant body meetings and regular Lodge meetings) between attendance and having a special, educational program. It's also okay to have a speaker or program once in a while that isn't strictly Masonic but just of general interest. However, people will not attend your special, Masonic education presentation (or regular Lodge meeting with education included) if they do not know about it. We really have to publicize what we are doing. Whether you use postcards, phone trees, news-letters or something else, people respond to notifications. I have been told by some; "We shouldn't have to invite people to come to Lodge". Well, be pragmatic. If we let them know about it and they come, isn't that more productive than lamenting the fact that they should have come on their own but didn't? One last thing and it's a simple one. People like to eat and they like to combine two or more things together in today's busy world. Take advantage of this fact. Have a meal before your Lodge meeting or educational program. If it works for you, try it on a regular basis. If your Lodge doesn't have the facilities to prepare a meal, meet at a local restaurant. Again, if your Brothers know about the meeting, Stated or Special, and they know they can have dinner with and enjoy the company of their Brothers, more of them will show up. It really works. The above ideas have worked for us. Keep trying. Just because something didn't work once doesn't mean it won't work this time. And keep trying new things as well as the old favorites. It really is up to all of us individually.